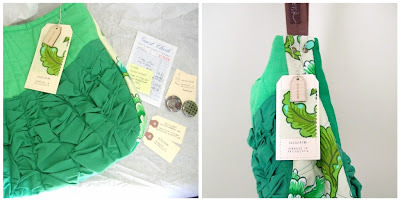 ORDINARY MOMMY DESIGN: Pretty Things in My Mailbox. Pretty Things in My Mailbox. I felt that a little celebrating was in order a couple of weeks ago. I'd hit my 400th sale in the shop, had a big old wholesale order, and have some fun things coming up. So when Katie Henry from Made by Hank listed some lovely new bags, I felt the time had come to splurge and snag one for myself. I've admired her bags for so long now, and one of the new pieces had everything I was looking for: a pretty color, a wee ruffle on the back (very important), and gorgeous floral fabric for interest. Sold! This bag is a dream! Sturdy, and simply gorgeous. It happened to come on the same day that my new Woodland Belle hair pins arrived. 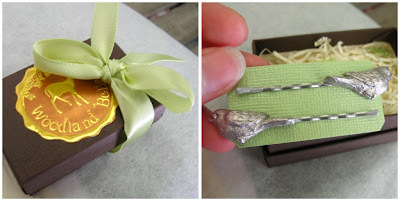 Mai's shop has also long been on my wishlist, and I purchased my first set of her hair pins just a little while ago. I love them dearly, and I was saddened when they wouldn't match an outfit simply because they're bronze. So I clearly needed a pair of pewter pins. Right? My bird pins are just as amazing as my twigs; well made, and very, very sweet. What goodies have found their way into your mailbox lately? oooo! i would love to own both of these!! so glad you decided to yourself - it's definitely well-deserved! that bag is SO pretty! Congrats on 400 sales!